The Netherlands Indies have a brief Aerogramme history. Initially the sheets were military, later civilian aerogrammes were introduced as well. The first issues are from October 1947 and come to a close at the end of 1950. Almost immediately after the Japanese surrendered, on September 2nd 1945, the Dutch sent the military to Netherlands Indies. This created the need for a postal service. The more soldiers were sent, the bigger the need. In 1945 almost 10,000 soldiers were sent. One year later this grew to 30,000. This amount included the 20,000 enlisted compulsory military servicemen of the "7 December" Brigade. Others were volunteers. Next to these troops there were Airforce and Royal Navy personnel, including, the Marines Brigade of more than 4,000 marines. The Netherlands had their Military Aerogrammes first in 1947; colourful and covered with instructions. All bear printed 10 cent stamps portraying Queen Wilhelmina (initially 10 cent issued in 1940-'47, NVPH 335 and later 10 cent issued 1947-'48, NVPH 478) in reddishpurple, the colour as well as all the printing. 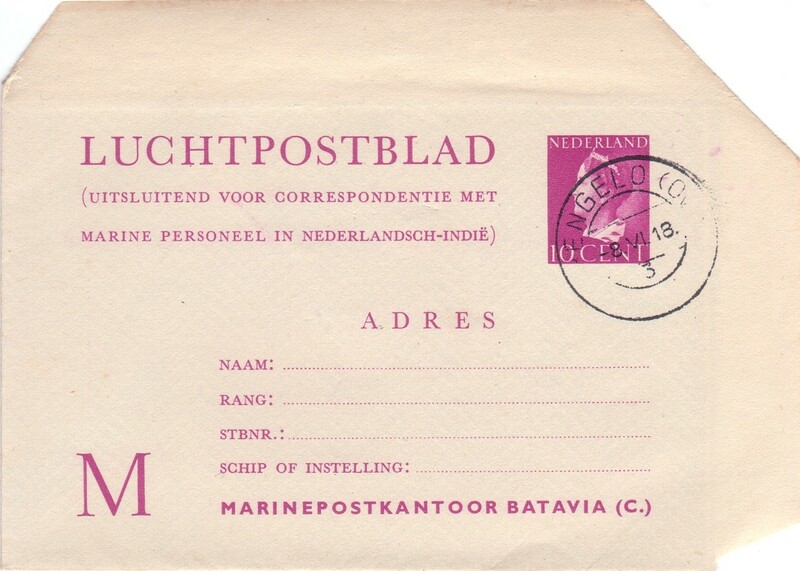 accompanied by "Veldpostkantoor (army field post office) Batavia" on the "L" type; and "Marinepostkantoor (navy post office) Batavia (C.)" on the "M" type. 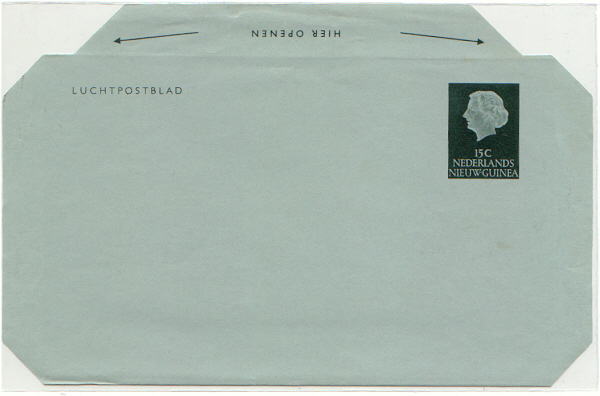 Two further types without imprinted stamps that carry stamp-sized spaces worded, "Postzegel van 10 cent" (no image available). 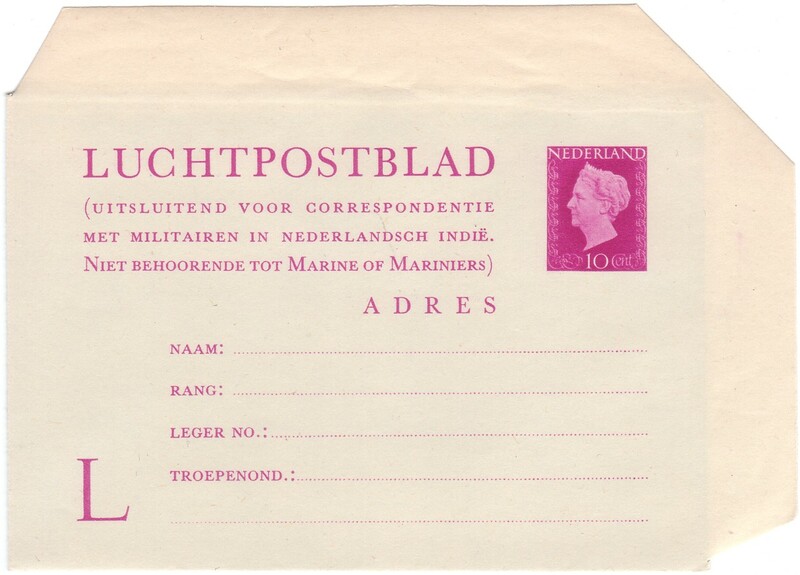 For the front address panels and the back sender's panels are covered, except for the actual spaces for name and address, by a minuscule repetitive printing of the words "Luchtpostbladmilitairluchtpostbladmilitair...". Yes, all in continuous non-stop, unspaced, wording as far as the pursuing eye can see, an overlay of printing providing some privacy for the interior letter that is effective and unusual. The issue of 1947-’48 has plain blue on the inside. 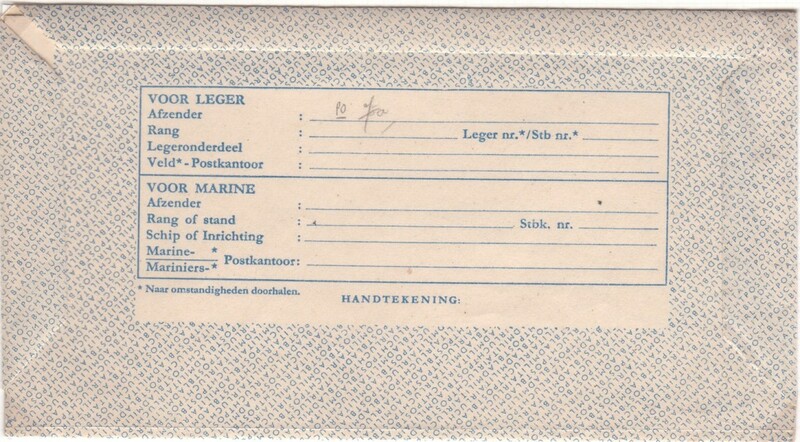 These types were for those at home to write to members of the Forces in the Dutch Indies. In complete contrast, the Active Service sheets flying the other way are very dour indeed. Some have an overlay, or often underlay, of coloured printing, but the paper is rough and tough and dull. One major benefit, not always seen on other country’s forces sheets is that all are postage free! The military aerogrammes in my collection are from November 11th, 1947 to April 5th, 1950, from soldiers and marines and these come in various types. 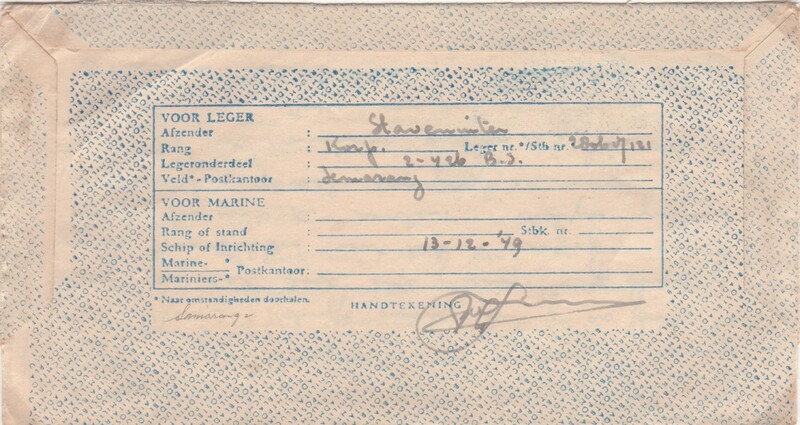 The type numbers used below are adopted from the Postzaken Posthistorische Studies VII, "De Postbladenkwestie" [Ir. C. Stapel] and Word's Air Mail Catalogue of Aerograms [Godinas]. - In old spelling (i.e. Same type 1, as above. - Document no. Nix w.o. According to Ir.C. Stapel there are 10 different types 3. The sender forgot to add the city, so this letter has been forwarded to almost all cities in the country where they had a "Parklaan". 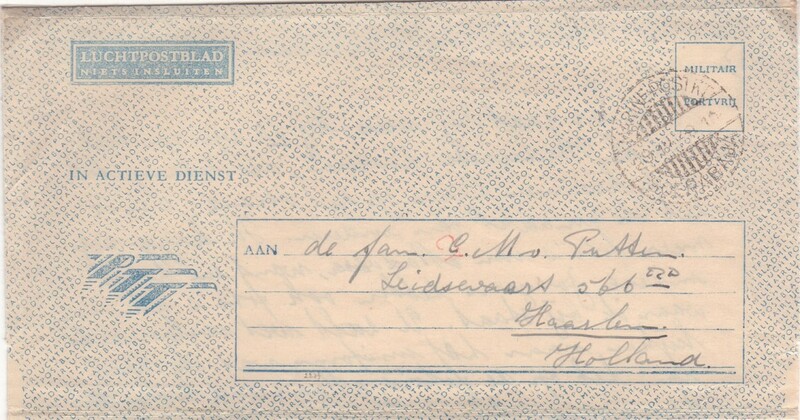 To make things even more difficult, it seems that the addressee had moved to a new address in Rotterdam. - Text in old spelling (i.e. This overview of military aerogrammes is not complete, more types have been used, see for more information "De postbladenkwestie" in Dutch by Ir. C. Stapel and the "World's Air Mail Catalogue" by François Godinas. RAPWI (Recovery of Allied Prisoners of War and Internees). Their role was to ensure speedy repatriation of prisoners of war and civilian internees. 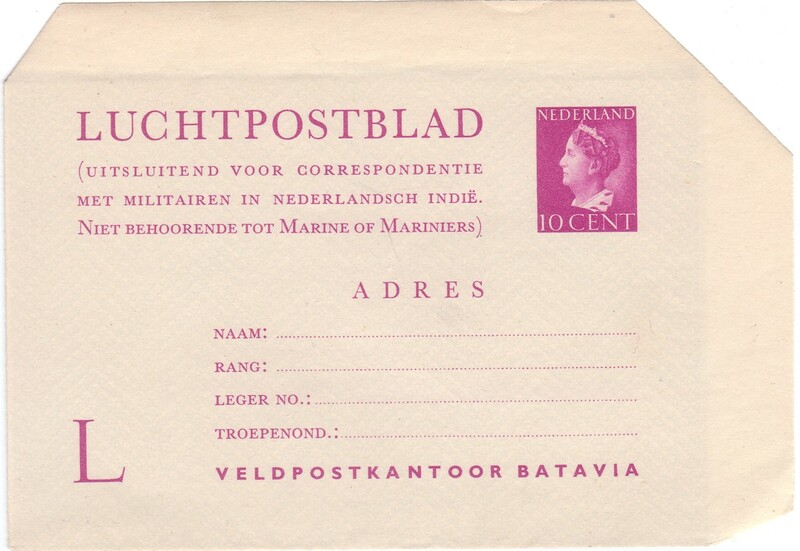 This cover was sent Feb. 15th, 1946 by Sergeant of the Royal Netherlands Indies Army, based in Batavia (now Jakarta) to family in Rotterdam. The first with military R.N.F. Censor and regular Balikpapan cancel. Proof that these were difficult times. 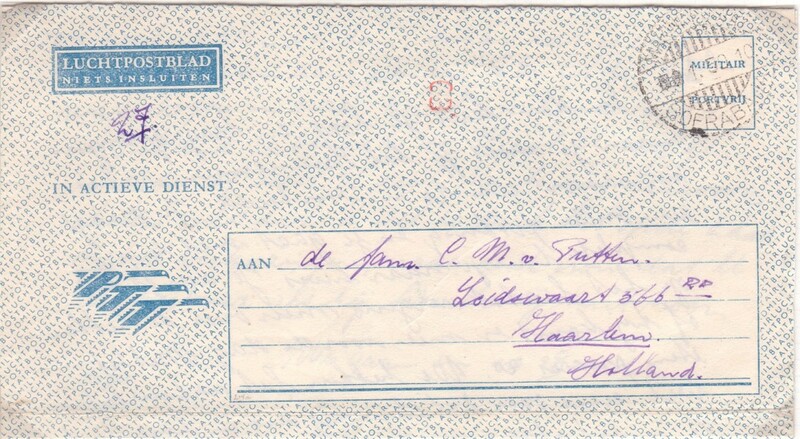 This particular letter never made it to the addressee and was finally returned to sender. The earliest were a pair of for Netherlands Nieuw Guinea in 1955: 15 c for local use and 35c for writing to the homeland with the word "Aerogramme" printed and the stamps respectively deep green and reddish-purple. The 15 cents issue was re-printed on lighter paper in 1957. Both issues come overprinted "UNTEA" (United Nations Temporary Executive Authority) as well, as trouble flared and the universal peace providers were called in on the 1st of October 1962. Three types of "UNTEA" overprint are known (see World's Air Mail Catalogue by François Godinas, edition 1974). 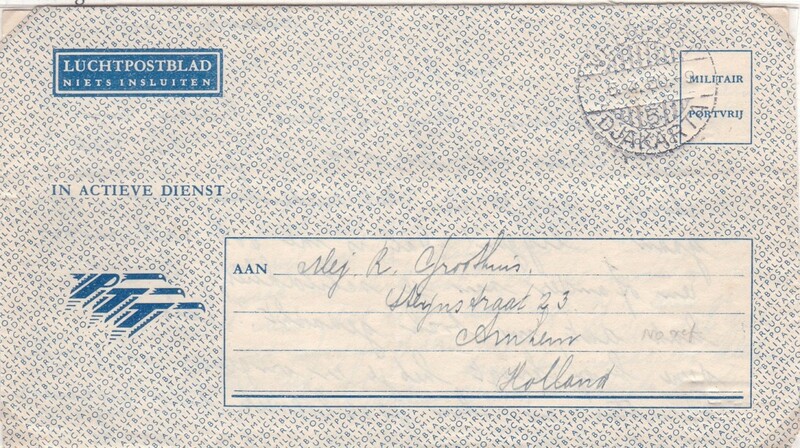 The first publication about Aerogrammes used in the Netherlands Indies was found in the "Nederlands Maandblad voor Philatelie", issued from 1948 - 1950, by Mr. G.J. 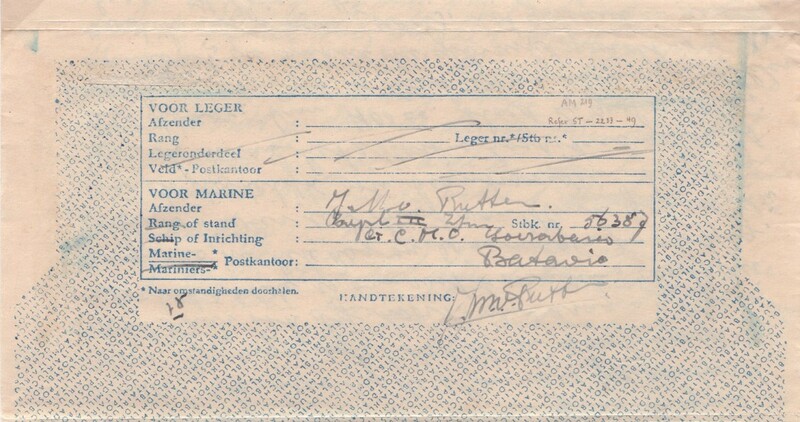 Broekman in his column "Poststukken". In 1953 François Godinas included some in his World Catalogue for Aerogrammes. In later issues new findings were included. In 1955 Tocila mentioned some in his Catalogue for Aerogrammes from the Netherlands and Colonies. He is far from complete as he did not include the ones mentioned by Broekman. All images shown in this essay are from my own collection.